The mission of X8 Drums & Percussion, Inc. is to provide our customers the ultimate interactive shopping experience of world percussion musical instruments. We are committed to providing superior customer service, strong product knowledge, exceptional video demos, and the best selection of high quality products. Why Buy from X8 Drums? Because we care! You, our valued customer, are the reason we exist. Our primary goal is to serve you, individually, one customer at a time, with exceptional product knowledge, outstanding service, and a diverse collection of high quality drum and percussion instruments. Every one of our customers has very specific requirements, and we pay close attention to meet and exceed them. Package all of this up with the best web shopping experience that assists you at every step to find exactly what you're looking for as quickly and efficiently as possible, and that's what we deliver. 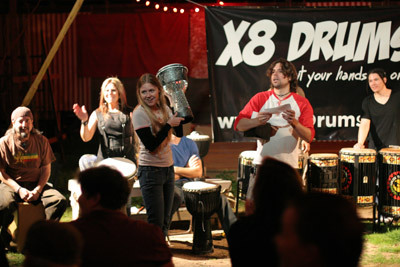 X8 Drums hosts community drum circles in the Texas area. Much like the vast selection of drums, percussion instruments, and Pro Audio we offer, X8 Drums is an eclectic group of customer service oriented individuals working in a team approach to give you the best shopping experience each and every time you do business with us. We work hard to earn your trust and your loyalty. Once you become an X8 Drums customer, you become an X8 Family member. We will always welcome you back home!! Feeding from the local flavor of Austin, TX, home of SXSW and the best music scene in the country, X8 Drums is dedicated to bringing quality products to our customers. From the ease of online ordering to the customer experience, our job is to help you make music, and we take that commitment very seriously. We speak drum. Literally. Dum-tak-slap. We test all of our products before adding them to the website, in order to help provide unsurpassed knowledge of our products and the best customer service possible. When we say we walk to the beat of our own drum, we mean it. We don't just sell djembes and percussion instruments; we sell a life-long love of music and rhythm, and all the gooey deliciousness, hand-numbing, life-enhancing, feel-good richness and delight of drumming. Check out the customer feedback page to find out what to expect when you are a part of X8 Drums. Thanks for visiting and enjoy the drums!